MuVar Vs. Google Website Optimizer Party Contest Deadline Approaches! Besides, many of the big names in our industry consistently advertise to increase the subscriber base because it would be easier to promote something to them rather than to a bounce rate. This may be true… If you’ve successfully built a relationship with them in the first place, that is. Imagine having a list of 100,000 subscribers, but only a fraction of them, say 0.1%, care about you and what you have to offer; how much is it worth? See? The goal is to have a motivated and responsive “fan base,” people who subscribe because they want to. Oh yeah, and since I personally connect the word “list” also with RSS, we were talking about feeds and FeedBurner, too. 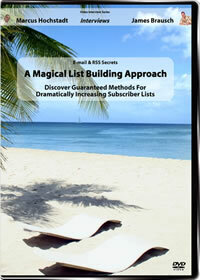 Until Monday 28th, noon time (PDT, or GMT -7,) you get E-mail & RSS – A Magical List Building Approach for $35. After this 72 hour special the price will go up to $100.